Five Peterborough Lions players and their head coach Darren Fox were celebrating a famous victory at Twickenham today (May 29). 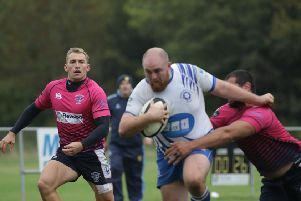 Sam Crooks, Will Carrington, Adam Barnard, Del Veenendaal and Tom Lewis were in the East Midlands side that beat Kent 33-27 in the County Championship Plate final this morning and Fox was one of their coaches. It was East Midlands first county championship victory and it arrived in exciting fashion as fortunes fluctuated throughout the 80 minutes. Kent led 15-13 at the break - Crooks having crossed for the Lions - and soon after the interval edged further ahead at 22-13. But East Midlands staged a stirring fightback to lead 23-22 on 54 minutes. Then Kent scored in the corner from a well worked move to lead 27-23 with 14 minutes to go before the outstanding Ampthill number eight Maama Molitika scored his third try of the game to put East Midlands back in front at 28-27 with 12 minutes left. Kent had a late penalty chance to go back in front but fired wide. Then in the dying seconds Tom Orton from Bedford Athletic charged over for a try to make the game safe for East Midlands.